Data analytics leaders use web and mobile app analytics to analyze customer behavior, application performance, and usage patterns to improve the digital customer experience. Organizations of all sizes use app analytics to see how users interact with their products. App analytics software captures and visualizes tremendous amounts of data generated by the organizations. It also captures the data from multiple sources, which is critical because most apps dont exist in just one place. Their data is often scattered across operating systems, devices, networks, and servers. There is an increase in the adoption of app analytics software among companies that use a centralized dashboard to view their app data. 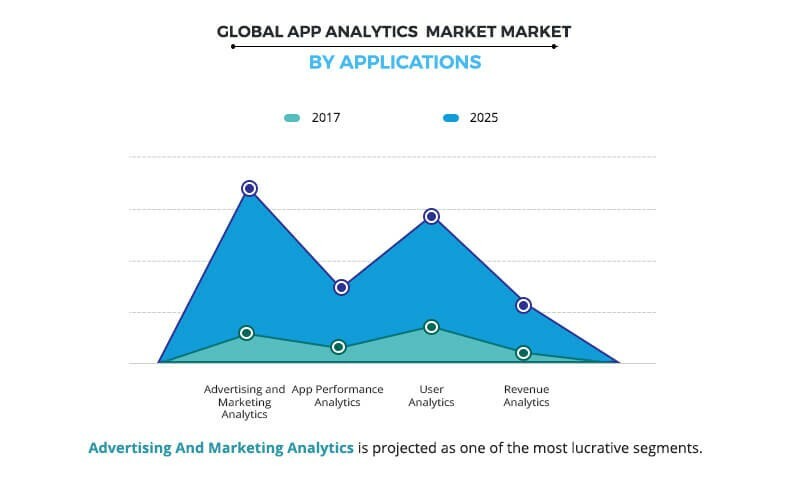 The global app analytics market size was valued at $920 million in 2017, and is projected to reach $3,798 million by 2025, growing at a CAGR of 19.5% from 2018 to 2025. The software segment dominated the overall app analytics market share in 2017 and is expected to continue this trend during the forecast period, as number of organizations are integrating app analytics software into their applications to monitor the users, app performance, revenue, ad monitoring, and marketing. The mobile app analytics segment dominated the overall market in 2017 and is expected to continue this trend during the forecast period owing to the growth in penetration of smartphones worldwide and increase in use of apps for mobile advertising. The retail & e-commerce industry is expected to witness the highest growth rate in the upcoming years owing to the rapid growth of adoption of app analytics software and services. This growth in adoption is due to massive usage of shopping apps. Moreover, retailers are compelled to use advanced analytics to ensure their business survives the competition due to growth in competition in the retail & e-commerce industry. This drives the adoption of app analytics software in this industry. North America dominated the overall market in 2017, owing to technological advancements and recent developments pertaining to the market. However, Asia-Pacific is expected to witness the highest growth rate during the forecast period due to increase in number of people equipped with tablets and smartphones across countries such as China, India, and Indonesia which presents a major app analytics market opportunity. The report focuses on the growth prospects, restraints, and trends of the global app analytics market. The study provides Porters five forces analysis of the app analytics industry to understand the impact of various factors, such as bargaining power of suppliers, competitive intensity of competitors, threat of new entrants, threat of substitutes, and bargaining power of buyers on the app analytics market growth. The global app analytics market is segmented based on component, type, deployment mode, applications, industry verticals, and regions. In terms of component, the market is categorized into software and service. Based on type, it is classified into mobile app analytics and web app analytics. Based on deployment mode, it is bifurcated into cloud and on premise. Based on application, it is classified into marketing analytics, performance analytics, in-app analytics, revenue analytics, and others. In terms of industry vertical, the market is classified into gaming, entertainment, social media, IT & telecom, health & fitness, travel & hospitality, retail & e-commerce, education & learning, BFSI and others. Based on the region, it is analyzed across North America, Europe, Asia-Pacific, and LAMEA. The key players operating in the global app analytics market include Adobe, Appsee, IBM Corporation, Countly, Mixpanel, Localytics, App Annie, Appdynamics, Appsflyer, and Clevertap. Increasing inclination of enterprises towards mobile-based advertising, rise in smartphone penetration in developing economies, growth in number of mobile & web apps, and rise in investment in the analytics technology drive the app analytics market demand. 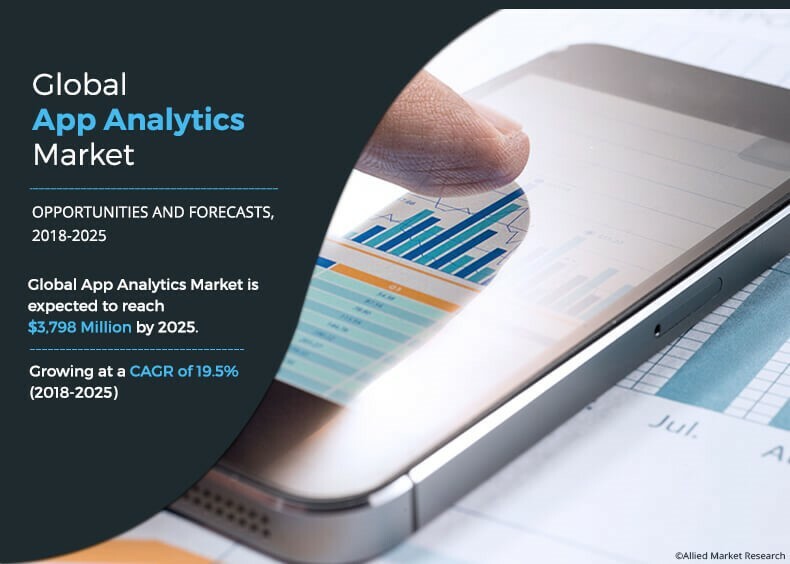 However, availability of open source alternatives and non-uniformity of data are the factors expected to hamper the growth of the app analytics market during the forecast period. Furthermore, major shift towards customer-focused marketing and increase in focus on higher ROI and growth in trend of bring-your-own-devices (BYOD) are expected to provide lucrative opportunities for the market. With the rise in economic and social connectivity, technology adoption is the major factor that contributes to the human progress. Developing economies are constantly moving toward technology adoption, supported by government initiatives and rise in expenditure. Smartphones have also seen as a huge symbol for opportunities in reducing the communication gap between these economies and their citizens. These devices have helped them in getting easy access to improved education, healthcare, and economic growth. According to a study, there has been a significant adoption of smartphones over the past years across the developing economies. Several developing countries have reported very high penetration of smartphones, which is a major indicator of their progress. For instance, smartphone ownership is extremely high in South Korea, around 94%, and Israel with 83%. In addition, about one-third of the worlds population across the developing nations use a smartphone. Growth in penetration of smartphones among the developing economies is expected to increase the adoption of mobile apps among customers and in turn is expected to drive the adoption of app analytics. A specific set of customers can be individually targeted through push messages by using app analytics software, which can double the rate of app opening and can help to attract more customers much better than generic push messages. Also, it provides the organizations deep insights, which helps engage new customers, who can be converted into higher stages of lifecycle. App analytics helps the organization to learn about customers, which dont return to their app after a single use, and the insights received help figure out targeted strategies of customer-focused marketing. Also, organizations are analyzing in-app customer behavior and profile data for customer-focused marketing, which drives the adoption of app analytics. The adoption of app analytics is expected to increase in the upcoming years as the focus of organizations is shifting toward higher return on investment (ROI). App analytics helps the organizations to monitor customer lifetime value by users generating high revenue from customers. Moreover, number of apps are contesting for visibility and customer attention due to which they are increasingly adopting different strategies to gain best return on investment. However, app analytics software are not only an app store optimization (ASO) but also an app store search engine. They provide a robust ASO strategy for high ranking in search results, which can improve ROI of organizations, which is expected to provide lucrative opportunities for the market. 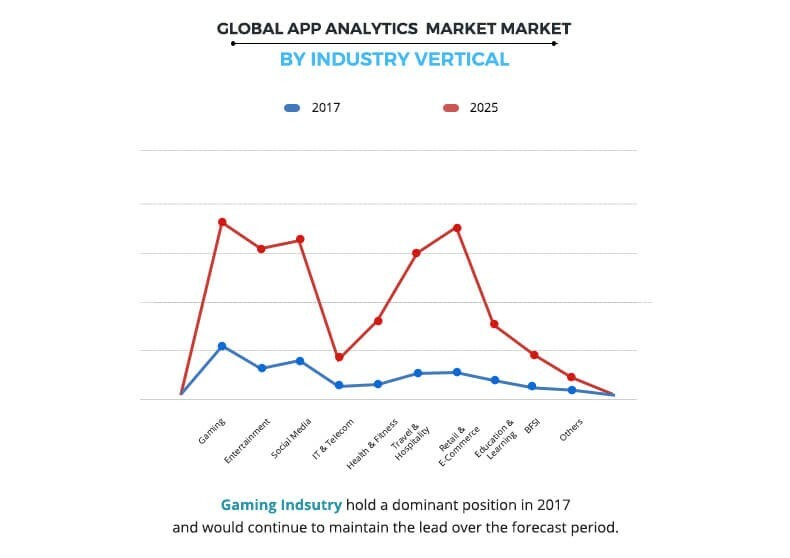 This study includes the analytical depiction of the global app analytics market trends and future estimations to determine the imminent investment pockets. The current market is quantitatively analyzed from 2017 to 2025 to highlight the financial competency of the industry. Porters five forces analysis illustrates the potency of buyers & suppliers in the global app analytics industry. The potential demand for app analytics is continuously on the rise in the BFSI industry, which fuels the growth of the market. The vendors of the market offer app analytics software to manage investment options, financial products, and transaction details. These software help organizations to detect fraudulent transactions. Moreover, app analytic solutions help banks to identify business segments and offer customized solutions to build a long-term mobile payments strategy. The mobile and desktop-centric user platform has introduced several mobile applications in the BFSI vertical. Adoption of app analytics in the BFSI vertical is expected to increase as it enables developers to gain a better understanding of the usage data of customers. In addition, various financial entities are using the app analytics solutions to boost the visibility of their apps, thereby increasing the overall customer experience. 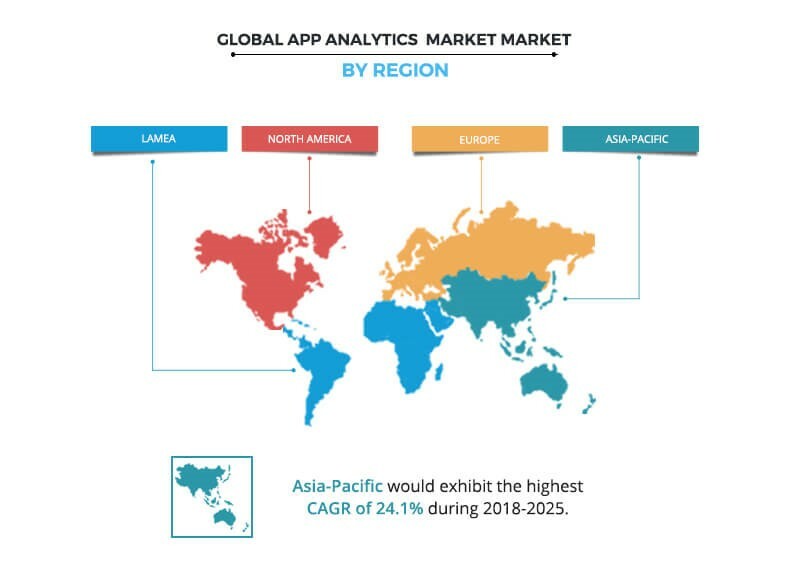 Moreover, the demand for app analytics software and services is continuously increasing in Asia-Pacific, which provides lucrative opportunities for the app analytics market. This growth in Asia-Pacific is attributed to the dynamic change in adoption of analytics solutions and services across multiple verticals. Also, the demand for analytics solutions and services is on the rise across the region, due to increase in volume of data and surge in use of digital technologies, Internet of Things (IoT), and connected devices, which drives the growth of the market. The global app analytics market is highly fragmented due to presence of several international as well as regional vendors. There is intense competition among app analytics companies in terms of pricing, user-friendly interface, value-added benefits, and service portfolio. The focus of the players to enhance their product portfolio is expected to further intensify the level of competition among the players in the app analytics market. Some of the major key players profiled in the report include Adobe, Appsee, IBM Corporation, Countly, Mixpanel, Localytics, App Annie, Appdynamics, Appsflyer, and Clevertap. These players have adopted various strategies to enhance their product & service offerings and increase their market penetration.